Please enter your credit card information during your online registration. The credit card will be charged with the total amount (registration fee as well as social program). Please transfer the registration fee as well as the fees for the social program (if booked) stating your reference number, your last name as well as the congress title “DOG 14” on your remittance slip. 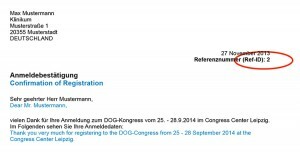 Congress registration payments are accepted in cash, by credit card or by EC/Maestro card. Please note that for all electronic payments on site by debitor credit card, the personal Identification number (PIN) will be needed. Checks are not accepted. Cancelations received in writing by 25.7.2014 are subject to a handling fee of Euro 25 (including VAT). No refund will be given for cancelations received after this date. All cancelations must be submitted in writing to the Conference Office via fax +49 (0) 40 32 50 92 44 or e-mail dog@interplan.de.